On Saturday, May 29 Tropical Storm Agatha--the first of the 2010 Pacific storm season--hit Guatemala. 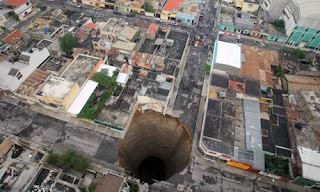 So far, Agatha has killed about 100 people and opened a sinkhole in Guatemala City large enough to swallow a three-story building (photo credit). As if that wasn't enough, the Pacaya volcano, situated just 15 miles south of Guatemala City, erupted on Thursday afternoon, spewing lava and rocks and flooding the capital with sand and ash. The airport closed, a television reporter was killed by a shower of burning rocks, and the President called for calm as thousands fled their homes in search of safety. I actually felt the tremor as I was teaching on Thursday afternoon, but having lived in Northern California for almost a decade, I thought nothing of it. I continued teaching with hardly a pause. But now tha t we know the extent of the devastation, it is impossible not to weep with the Guatemalan people. The death toll on these twin disasters is still climbing, and no one yet knows the price tag on rebuilding the 800 or so homes destroyed and otherwise giving aid to the victims. A country that was already facing unbelievable odds now must face one more: recovering from the one-two punch of Agatha and Pacaya. In a horrible twist, our students in the McGeorge InterAmerican Program found themselves in the midst of the crisis. They had been on a field trip with their professor--my colleague Raquel Aldana. With the rains came mudslides that closed the roadways and effectively trapped the McGeorge group where they were for a couple of days. Raquel courageously shepherded our students to safety and kept everyone calm. They are now safe and well having lived through an experience they will never forget. Throughout the crisis McGeorge has been incredibly supportive, as have friends, colleagues and family. How lucky we are--those of us with money, a U.S. passport, and friends and loved ones. We have the luxury of knowing we always have an exit strategy. So many here in Guatemala are not quite so lucky. I'll be teaching class again for the first time tomorrow. It is difficult to imagine discussing the finer points of GATT Article I's non-discrimination provision; but I also realize my work here is very relevant. I don't have to convince these students of the need for every country to have a basic level of wealth and development to care for their people in times of crisis. My students have faced the problem head on. And they have been changed by it.